Purchasing glasses can be a bit overwhelming as it is an investment both financially and for your health. In order to be best prepared for buying your glasses here is a summarized understanding of some of the most popular lenses and coatings to help you make an educated purchase. The Purpose : These lenses are ideal for anyone who spends their day in front of computers or in an office setting. Depending on the lifestyle need, the range of vision can be adjusted to suit individual needs. The Audience : For anyone who spends their day on the computer and needs assistance seeing what they are reading up close, a Computer lens is often the best fit. However, if you are someone who is working on the computer, but often find yourself greeting individuals at a distance and needing your glasses while walking around, an Office lens may be best for you. It is important to always remember to express your concerns and details about your needs while purchasing glasses. This way our professionals can help suit you to a product that is best for you. Pros : They help reduce eye strain, make your eyes less tired, and are chosen for your specific needs and lifestyle. This image is a great example of the different depths of vision you can receive from home and office lenses. The Purpose: Photochromic lenses, often known as Transition© lenses, are an ophthalmic lens that is clear but darkens into a tinted lens (or sunglass) in UV light. The Audience: The ideal candidates for this type of lens is someone who is sensitive to light, but does not want to continually switch back and forth between their regular glasses and prescription sunglasses. Pros: These lenses are extremely convenient and help protect your eyes from harmful UV light. Cons: The photochromic does not work while in a vehicle, due to the fact that the window already blocks the UV rays. 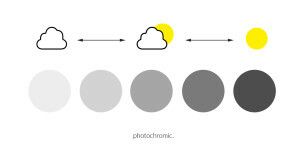 This simple illustration is a great representation of of photochromic lenses work! The Purpose : Often referred to as “bifocals without the line”, progressive lenses are both extremely popular and helpful. These lenses are used for patients who need assistance for seeing both near and far. Rather than having to switch between a pair of distance glasses, and a pair reading, the progressive lens merges both needs into one lens. The technology in a progressive lens creates a smooth transition between the different focal lengths to allow for corrected vision at all distances. The Audience : These lenses are great for patients of all ages that are in need of corrected vision at different focal lengths. Often a younger to mid age audience are drawn to them as they are both effective and esthetically pleasing. Pros : Allows for corrected vision at all distances, while looking esthetically pleasing. Patients thoroughly enjoy the fact that there is no distinct line across their lens to indicate the need for reading vision, unlike the bifocal lens. Cons : Depending on the person, progressive lenses can be difficult to adjust to. When you are a first time progressive wearer, you will need time to adjust to the distortions on the side of your vision. It is important for patients to know that you must always move your head to where you want to look, rather than just your eyes in order for the lens to benefit you properly. As you can see in the image above, progressive lenses will include the 3 fields of vision, while causing slight distortion on the sides. 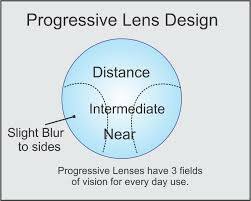 This is why it is very important for patients to move their head to where they want to look with progressive lenses. The Purpose : This coating is an option that can be added to lenses at the time of purchase. It is highly recommended to have on your lenses as it helps cut the glare when using computers, or driving at night. The Audience : The ideal audience for this coating is anyone who finds themselves distracted by the glare from lights, spends a lot of time in front of electronics or screens, or often drives at night. Pros : It helps reduce glare and gives sharper vision for patients. Cons : It is an added cost when purchasing lenses. Shown above are a few examples of how anti reflective coating is a benefit for many aspects of day to day life. The Purpose : Blue light is the colour of light that is emitted from the screens of our many technological devices. Recent studies have shown that blue light has the ability to throw off our melatonin levels and internal clocks. Also, when looking at computer screens all day, blue light can strain your eyes, making them tired and often sore. 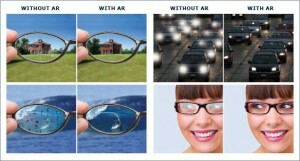 This specific coating helps to reduce the effects of blue light while aiding you in your everyday life. The Audience : Anyone who spends plenty of time working on computers, cellphone, tablets, or other devices. Pros : This lens coating helps reduce the effects of blue light on your eyes and your overall health. Cons : While this technology is still advancing, it is possible that you may find some of the blue light lenses to have a bit of a yellow tint to it. It is at a disadvantage for aesthetic reasons. The Purpose : To allow patients to see for both distance and reading out of the same lens. The Audience : The main audience for bifocal lenses are often seniors who are adjusted to theses lenses and have been using them for a long time, or individuals who are non-adapt to progressive lenses. Pros : Bifocals are beneficial for patients as there is a direct change in prescription. Unlike progressive lenses, they will not experience any distortions, as the prescription changes either below or above the line. Cons : Some patients find this style of lens to be less aesthetically pleasing. This image is a great depiction of how a bifocal lens looks. In summary, it is important to note that these products will all very in cost based on quality and materials used. Our Optometric Assistants are specifically trained in all of the products we provide in order to help you find the best fit for your lifestyle. 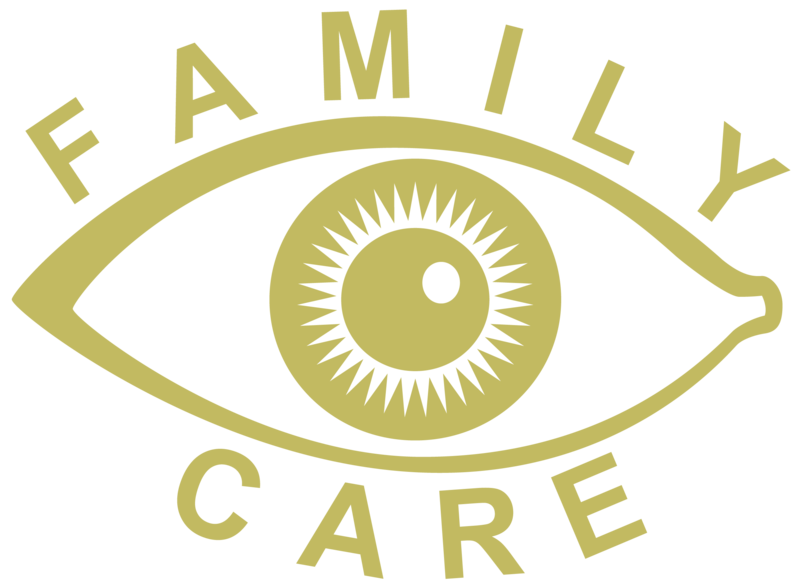 Copyright 2019 Family Eye Care. All Rights Reserved. This website was developed with the assistance of NEOnet Inc.